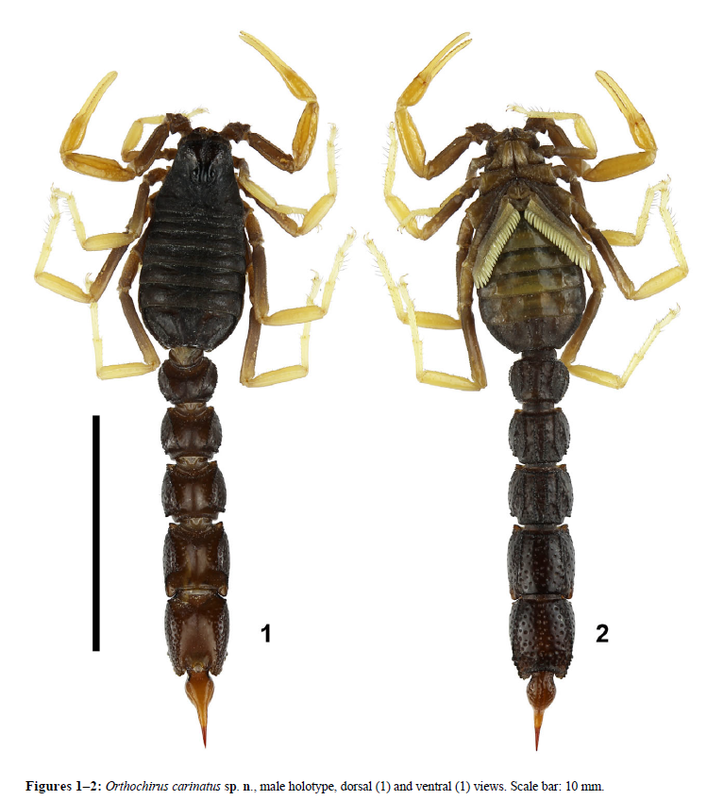 Shahrokh Navidpour and co-workers have published a new paper on the scorpion fauna of Iran and a new species of Orthochirus Karsch, 1891 (Buthidae) is described. Nine species of scorpions belonging to two families are reported from the Alborz, Markazi and Tehran Provinces of Iran. Of these, Compsobuthus kaftani Kovařík, 2003 is recorded from Tehran Province for the first time; Compsobuthus matthiesseni (Birula, 1905) is recorded from Alborz Province for the first time; Hottentotta saulcyi (Simon, 1880) is recorded for Alborz and Markazi Provinces for the first time; Iranobuthus krali Kovařík, 1997 is recorded for Tehran Province for the first time; Mesobuthus eupeus eupeus (C. L. Koch, 1839) is recorded from Alborz, Markazi and Tehran Provinces for the first time; Odontobuthus doriae (Thorell, 1876) is recorded from Alborz Province for the first time; and Scorpio kruglovi Birula, 1910 is recorded for Alborz and Markazi Provinces for the first time. Orthochirus carinatus sp. n. from Iran (Alborz and Tehran Provinces) is described and fully complemented with color photos of preserved specimens, as well as of its habitat.